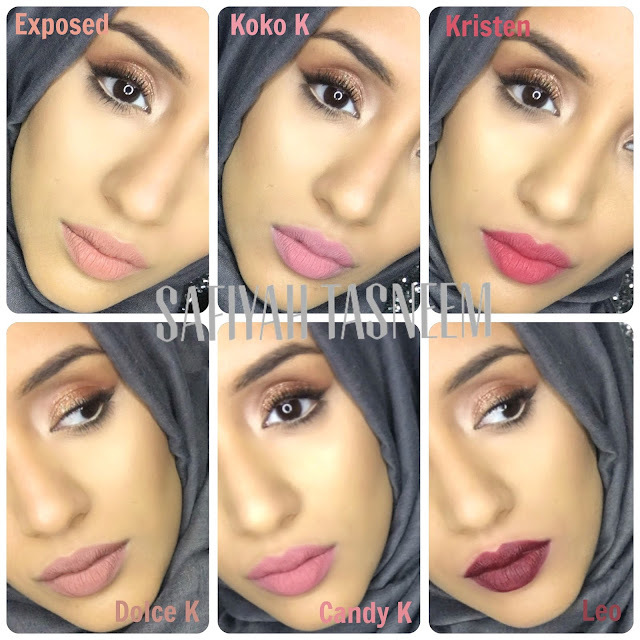 SAFIYAH TASNEEM : Sunday Swatches: Kylie Cosmetics Matte Liquid Lipstick Swatches + Review + GIVEAWAY! I genuinely struggle to find decent swatches with online makeup brands (Gerard Cosmetics, Huda Beauty etc) and Kylie lipsticks are the same. What's weird is, everyone's lips look different wearing one shade; for example my friend could wear Dolce K and it would look like a light brown on her, I wear it and it's a cool toned brown, and on a fairer person it would look dark brown. Either way I've got a darker top lip so I tend to buff a bit of concealer or foundation around the edges of my lips to give it an even base for the colour to show on. 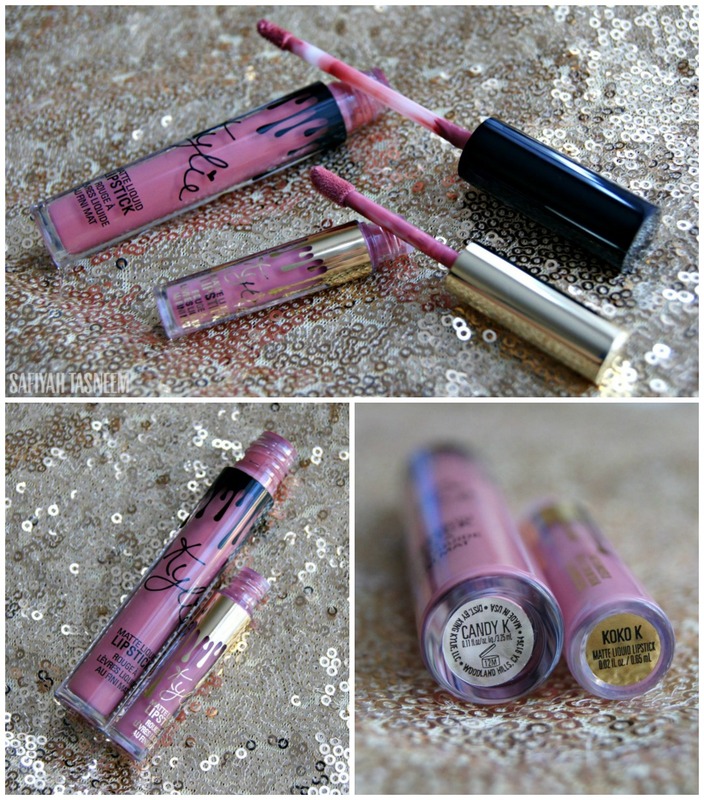 You get 3.75ml in a full size Kylie and a mere 0.65ml in the minis (they're so tiny!!). Colour & Pigmentation: I'd say the pigmentation is at a medium level for a matte liquid lipstick; the texture is definitely thin and almost watery compared to the NYX Lip Lingeries. Colour wise, my favourites are: Dolce K, Candy K, Posie K and Kristen. 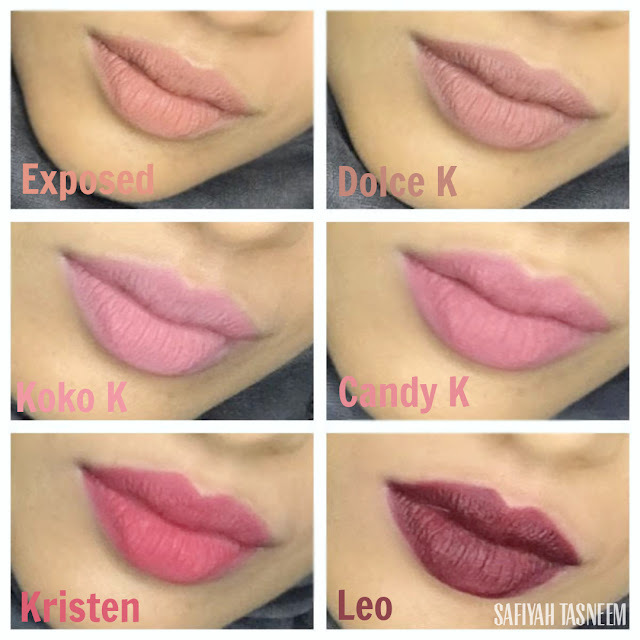 Least favourites: Koko K because it's too cool toned for my dark lips (have to pat in) and Leo as it applies slightly patchy. Finish: These don't leave a sticky finish; they dry fully matte. N.B: they do dry darker than when first applied. Once dried to a matte finish, these crack like no ones business on my lips! I mean every line in my lips are defined and the product doesn't reach inside the lines so it just looks awful up close but fine from afar. They do however feel like you have nothing on your lips. Scent: My most favourite thing about these actually: they smell like marshmallows, love it! Longevity: I found these wear off faster than the NYX lip lingeries unfortunately (maybe because of the thinner consistency?). However a friend of mine says she prefers these to the NYX Lip Lingerie as she felt they were too dry for her whereas the Kylie ones don't. So from this I gathered that liquid lipsticks' comfortability are dependant on your lip texture. I prefer moussey/thicker liquid lipsticks as I feel they are more comfortable and less likely to crack. Price: The price for both a lip kit (lip pencil + liquid lipstick) and the Birthday Edition set is around £34 (excluding unlucky customs charges). Available at KylieCosmetics.com. Overall rating: I'm on the fence about these; I love the shades available, the packaging, love the scent, love that they feel like you're practically wearing nothing. However, the fact they crack on my lips and define every line makes me feel weary of wearing these. Also, if you're unlucky enough to be hit with a customs charge of around £9-12, it bumps up the price to around £46 which in my head isn't worth it for something that cracks on my lips! I give it a 3.5 based on the fact that most people I know do get hit with the UK customs charge and also that it's not as long-wearing as I'd hope it to be for the price. Right, so now that the review is over, it's time to get a chance to win a Posie K lipkit which includes both a lip liner and liquid lipstick. To enter, all you have to do is subscribe to my YouTube channel. You can also have additional entries by following me on Instagram or liking my page on Facebook (enter below). Ends SUNDAY 4TH SEPTEMBER 2016 at 11:59pm BST! Winner will be emailed on September 5th 2016. 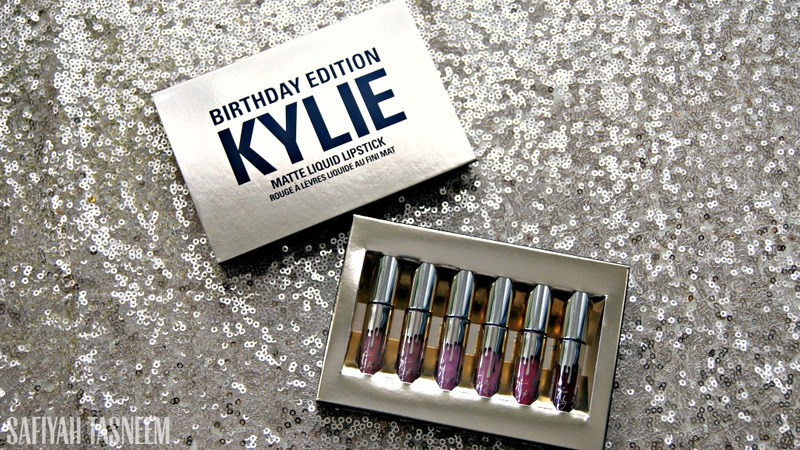 Have you got any of the Kylie lipsticks? Which is your favourite? EDIT: Check the Holiday Edition swatches here! Candy K is my absolute favorite, it's so pretty!